Current Status of Laparospic Education and Training in United States Surgical Residency Programs. Are We Doing Enough? Background: The amount of laparoscopic training provided to surgical residents varies widely from institution to institution. Consequently, the ability to safely perform complex laparoscopic procedures also likely varies. Nonetheless, graduating residents are expected to perform laparoscopic procedures independently without additional training. The extent to which residents are adequately trained for such procedures is unclear. Methods: An online survey, approved by our IRB, was distributed to all surgical residency program directors in the U.S. Data obtained included residency setting, size, number of residents seeking fellowship training, and type of laparoscopic training offered to residents. Program directors were asked which procedures graduating residents should be performing without further training. 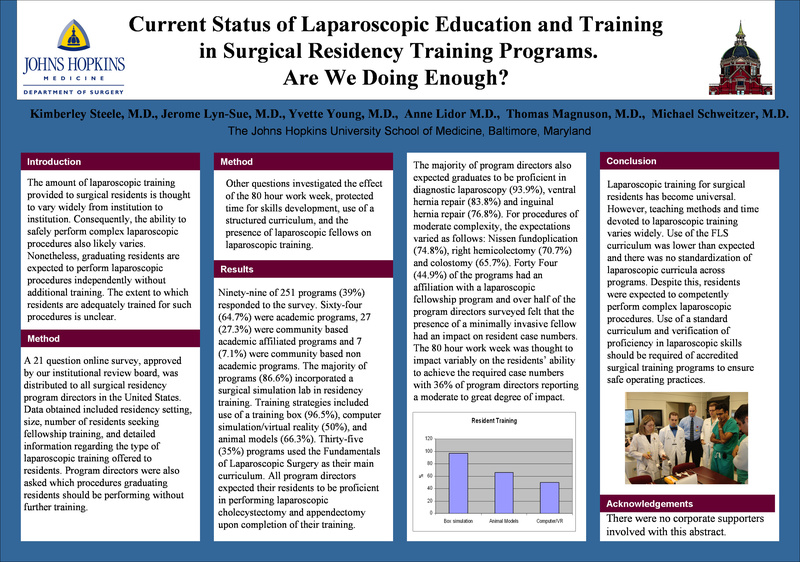 The effect of the 80 hour work week, protected time for skills development, use of a structured curriculum, and the presence of laparoscopic fellows on laparoscopic training was investigated. Results: 99 of 251 programs(39%) responded to the survey. 64(64.7%) were academic programs, 27(27.3%) were community based academic affiliated programs and 7(7.1%) were community based non academic programs. The majority of programs(86.6%) incorporated a surgical simulation lab in residency training. Training strategies included use of a training box(96.5%), computer simulation/virtual reality(50%), and animal models(66.3%).35(35%) programs used the Fundamentals of Laparoscopic Surgery(FLS) as their main curriculum. All program directors expected their residents to be proficient in performing laparoscopic cholecystectomy and appendectomy upon completion of their training. Most program directors also expected graduates to be proficient in diagnostic laparoscopy(93.9%), ventral hernia repair (83.8%) and inguinal hernia repair (76.8%). For procedures of moderate complexity, the expectations varied as follows:Nissen fundoplication(74.8%), right hemicolectomy(70.7%) and colostomy(65.7%). 45% of the programs had an affiliation with a laparoscopic fellowship program and over half of the program directors surveyed felt that the presence of a minimally invasive fellow had an impact on resident case numbers. The 80 hour work week was thought to impact variably on the residents’ ability to achieve the required case numbers with 36% of program directors reporting a moderate to great degree of impact. Conclusion: Laparoscopic training for surgical residents has become universal. However, teaching methods and time devoted to laparoscopic training vary widely. Use of the FLS curriculum was lower than expected and there was no standardization of laparoscopic curricula. Despite this, residents were expected to competently perform complex laparoscopic procedures. Use of a standard curriculum and verification of proficiency in laparoscopic skills should be required to ensure safe operating practices.